Northern Ireland is enjoying somewhat of a renaissance in the world travel scene, with visitors coming from all over the world to enjoy the great scenery on show. Back in May the country welcomed tens of thousands of visitors for the Giro D’Italia, and with the Titanic Visitor Centre and Game of Thrones Filming Locations attracting thousands of tourists throughout the year, Northern Ireland is quickly becoming a must see travel destination. If you are looking for some ideas for a weekend break or a short holiday in August, here’s 5 activities that may make you want to head north. For the aviation fans among you, this is a must see. This 3 day festival celebrates all things flight, with an Aviation Village set up in the town of Newcastle on Saturday 8th August to inform visitors of everything they need to know about the industry. You can also enjoy the experience of sitting in the cockpit of a BAC jet for the day and learn about the history of many famous military planes. With entertainment for kids and great food on offer, this promises to be a great weekend in the seaside town. 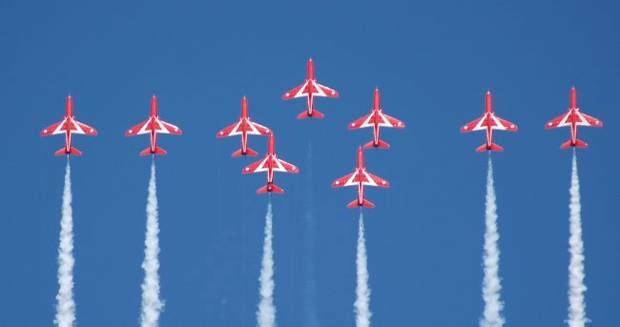 The highlight of the festival of flight is the display from the famous Red Arrows, as they fly over Dundrum Bay and around the Mourne Mountains – a truly spectacular scene. More details and full schedule here. If speed is you thing then the Ulster Grand Prix is for you. Famous for being the world’s fastest road race, the weeklong exhibition of motor racing attracts some of the top drivers from the UK and Ireland, and as far afield as Australia. There are practice sessions on Wednesday 13th and Thursday 14th August, with the main event taking place on Saturday 16th August. If you are planning a trip to Northern Ireland and the north coast in the coming weeks, this is certainly worth getting along to. If you’re a fan of music festivals Northern Ireland has not one but two big festivals in August, beginning with Belsonic Music Festival on Friday 15th August. Belsonic has attracted some of the biggest names in music in recent years, and this year is no different with top names like Example, Biffy Clyro, Queens of the Stone Age and Imagine Dragons all performing. Sandwiched either side of the final Belsonic performance by Imagine Dragons on Friday 22nd August is the popular Tennents Vital Festival, and this year it has attracted global stars The Killers, Bastille, David Guetta and Steve Angello to perform over 2 days. Tennents Vital – Thursday 21st and Sunday 24th August. Let’s face it, one of the best things about travelling anywhere in Ireland is the sound of music, and laughing with new friends and old over a drink. Hilden Brewery in Lisburn have a festival that celebrates both, with the Hilden Beer and Music Festival a must visit for lovers of beer and music. The Hilden Brewery make a range of craft beers, and you enjoy these along with the best beers on offer in the UK and Ireland in unique Georgian courtyard at the brewery. With music throughout the weekend, there is a real intimate and relaxed feel to this festival, and it is one you will certainly enjoy and return to in future years. You can find out more about the festival here. Last on my list of events in Northern Ireland this August is the Walled City Tattoo, which returns for the second year to Derry following its success last year. There is no shortage of entertainment for the weekend with traditional music and dance, Massed pipes & drums, and the famous motorcycle display team The Imps all entertaining the crowd. Last year saw 15,000 people flock to Elbrington Square to witness a wonderful weekend of song, dance, comedy and pure entertainment. This year promises to be a case of more of the same! The video below will give you a little taste of what you can expect, should you decide to take a trip to Derry this month. So there you have it guys, 5 reasons to consider taking a short trip to Northern Ireland in August. These are just some of the great events taking place around the province this month.